It’s no secret that Ibiza has more than its fair share of fantastic beaches, offering everything from bongo-infused hippy vibes on secluded pine-scented sands to buzzy pre-club drinks with spectacular sunsets. Here we share our selection of the best and most beautiful calas and playas Ibiza has to offer, many perfect for recharging after a night of throwing shapes. This lovely curved bay with its white sand beach has something for everyone. The beach – that sits between a steep hill and the clear blue sea – looks out onto Es Vedra, a limestone outcrop a little out to sea. Ibiza legend dictates that this little island is the most magnetic point in the world, which makes it a popular spot for both locals and tourists alike. If you like the idea of all things mystical, make sure you pay a visit. 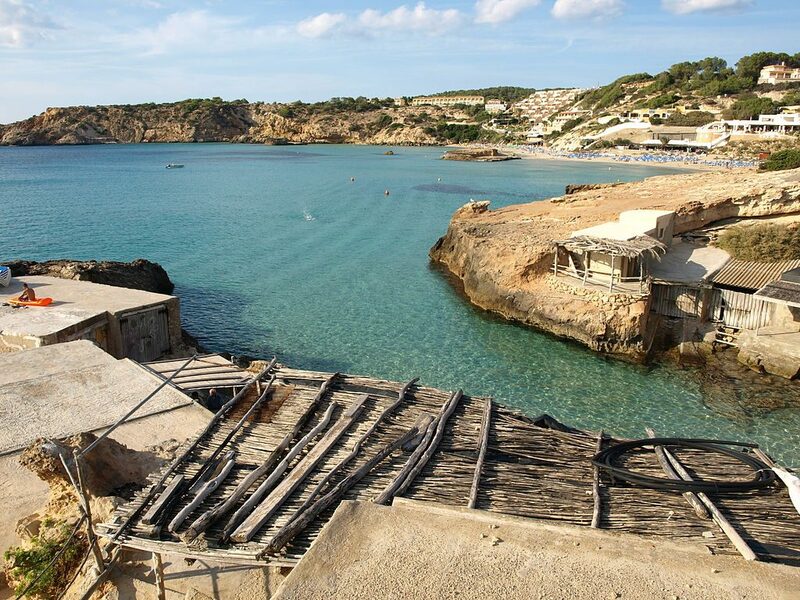 Located on the West of the island, Cala Conte has a small beach with sun loungers as well as a rocky coastline with plenty of carved flat platforms to base yourselves on for the day – perfect for anyone who loves the sea but hates the sand. The water is shallow too which makes it a great spot to bring kids. Spend all day in the water until sunset, then head up to one of the three restaurants on top of the cliffs to enjoy the wide-lens views of the sun dropping behind the horizon. This beach is known amongst the young, hip partying crowd. With atmospheric beach bars, and double bed style sun loungers, it’s the place to go to start the party just as much as it is for a recovery breakfast the following day. Located at one of the southern most points on the island, it has a natural park area of dunes as a backdrop and uninterrupted views to the south towards Formentera. If you’re looking for a place with all the amenities, games and entertainment for the whole family, Cala Tarida has it all. Aside from beautiful water it has the longest stretch of white sand beach on the west coast. You can choose from beach games like volleyball, or waterskiing and diving. Expect it to be popular as there are a few resort hotels nearby too. But with sun loungers and umbrellas to hire, you’ll soon be able find your perfect spot for the day. You’ll be rewarded after an hour’s walk through pine forests as you arrive at this wonderfully unspoilt pebble beach tucked in at the bottom of these rolling hills. Inhale the smell of the pine trees, enjoy the surrounding nature and views from the cliff edge as you make your descent. Don’t expect to get fed down there, so make sure to take your own supplies. As you walk down the pine lined path to the sea, between two steep edged cliffs you’ll find Sa Caleta beach (also known as Es Bol Nou). The cliffs are in fact listed as a World Heritage site by UNESCO and on top of them you’ll find some Phoecian ruins considered to be the first settlement on the island. There is a restaurant Sa Caleta which comes highly recommended for producing delicious Mediterranean style food as reasonable prices. If you’re looking for a nearby beach away from Cala d’en Bossa but near enough to walk to from Ibiza Town you can head to this stretch of beach which is popular with the club workers of Ibiza. Lined with restaurants of varying price ranges, the beach has sun loungers and parasols, and watersports available and a wooden boardwalk around the edge of the beach. At night time this little town also has a nice vibe, with the bars and restaurants filling up with a more adult crowd. This little sandy stretch in the north of the island is a popular spot for residents. It’s considered a great spot for sunrise which also means you can reserve yourself the best spot on the beach too. Even if you aren’t up for sunrise, make sure you plan to get there early in the day as the beach is cast in shade by late afternoon. Aguas Blancas is officially a naturist spot so expect your fellow beach goers to be getting an all over tan. Have a go at your own mud mask by adding the red clay from the cliffs to water and lathering all over your body. It’s meant to leave your body silky soft. What Punta Galera lacks in sand it more than makes up for in spectacular rock formations, with huge multi-layered slabs jutting from sheer cliffs over the sea. Facilities are limited (non-existent) and a lack of shade means there’s nowhere to escape the rays, though this incredible geological spectacle remains perennially popular with sun worshippers, nudists, and yoga and meditation enthusiasts. It also provides one of the finest, and less busy, vantage points for enjoying an Ibiza sunset. Meaning “Well of the Lion”, this lovely little stretch of soft sand and pebbles remains one of the least visited beaches on the island. More popular with residents that tourists, its often still relatively quiet in peak season, also making it a hit with the occasional nudists. Rows of wooden fishermen’s huts add a dash of rustic charm, while a chiringuito (beach hut bar) offers a range of drinks and snacks until the sun goes down. This is a real gem of a beach, popular with locals when the beaches are full to bursting on other parts of the island. On one side are the little boathouses with their gangways down to the sea, and across the aqua marine waters on the other side are rugged rocky cliffs that shape the beautifully curved bay. There’s a little chiringuito or beach hut that serves simple, healthy dishes and there are sun loungers and umbrellas available to hire. Getting to Ses Balandres is certainly a challenge, with the trail down involving rickety wooden steps, handrails, and even rock-face descents via ladder and ropes. If you survive that the setting is as secluded as they come, with a little strip of sand and pebbles, crystal-clear waters, and a beautifully curving bay. In the middle of the cove are the rocks of Ses Margalides, a low sea arch and a great spot for underwater exploration. Not for the faint-hearted or physically unfit. This iconic beach is popular with the northern Ibizan and hippy crowd who congregate every Sunday to look out to the rock of Cap Bernat in the bay to a soundtrack of bongo drums. By day it’s busy too so make sure you arrive in good time to park and walk down the road to the beach. Although within walking distance of San Antonio’s Sunset Strip, Cala Gracioneta shares none of its bustling, booze-fuelled atmosphere. What this lovely little cove does have is turquoise water, fine sand, and rocky inlets that create a real sense of seclusion. It’s another beach popular with the locals, while the El Chiringuito restaurant and beach club also hosts regular weddings. You can also clamber along the rocks and be treated to one of the island’s legendary sunsets. Surrounded by pine-scented forests and rugged red cliffs, this is one of the most isolated bays on the island, as well as being one of the best for snorkelling. 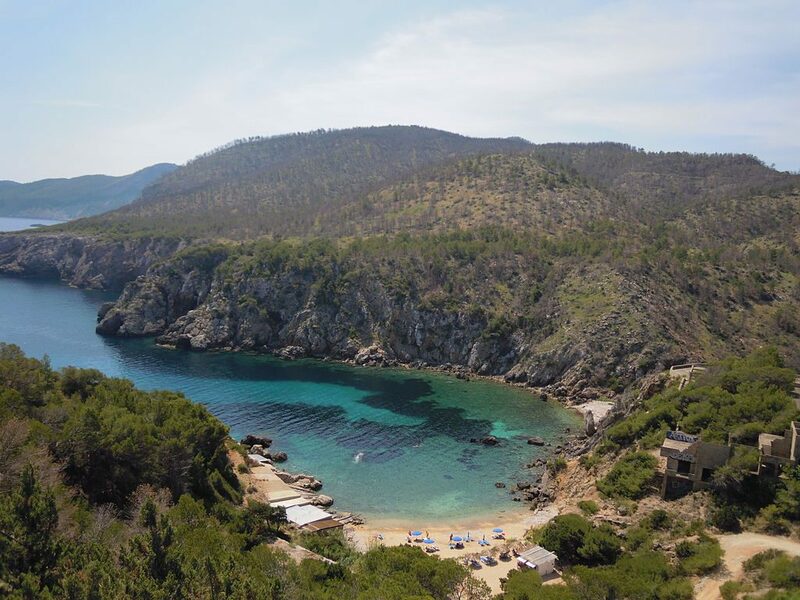 Cala Xarraca comprises three distinct areas, with the middle the most popular and the two smaller either side more secluded (and so attracting the odd naturist). There’s also a family-run restaurant with excellent seafood, plus to the left of the bay is a natural mud bath, so slap it on for a facial au naturale.